This was tested with FreeBSD 11.1-RELEASE-p9 and Debian 9.4.0 and on two different hosts (my trusty ol’ ThinkPad X201 and a homemade station with a Ralink Ethernet card). Still a lot of packets to test though. Don’t know if IPv6 packets themselves go through or not. However RS/RA don’t and that’s sufficient to make IPv6 completely unusable. I will update the figure above when I know more. Although that may be never, don’t know yet. One solution would be to upgrade the firmware to either DD-WRT or Tomato router. However those are not supporter on the DIR 605L rev B2. Also this was supposed to be a replacement and we already bought a much better alternative. tcpdump -i em0 "icmp == 8"
tcpdump -i em0 "icmp6 == 128"
tcpdump -i eth0 "icmp6 && ip6 == 128"
We have stub-zones configured on our gateway for reverse IPv6. Our ISP doesn’t delegate rDNS but we still want to lookup addresses (at least on the local side). To do so I configured a stub-zone from unbound, our local caching DNS, to our own rDNS authoritative server. Apparently unbound wants an IPv6 for its IPv6 rDNS queries to the stub-zone. Since IPv6 is not always working I solved that using the local interface. That is, the rDNS authoritative listen on localhost:5353 and unbound uses this as its stub-zone addresses. After quite a long time we are now back in the v6 world thanks to Hurricane Electric. We lost our IPv6 connectivity when migrating our VPS from OpenVZ to KVM. There is no IPv6 on the newer OVH VPS 2016 although we had one on the older version. I don’t know why it is and when asked via a ticket they assured me that it would be available soon. This was months ago, still no IPv6, and I am not alone. This is becoming long and really awkward for OVH, supposed to be the 3rd hosting provider in the world. Setting up the tunnel with HE was painless. You just configure a simple 6in4 (gif on BSD / sit on Linux) tunnel from your IPv4 to the endpoint they provide to you and your are done! In the meantime we also configured the IPv6 prefix that we received from our ISP. 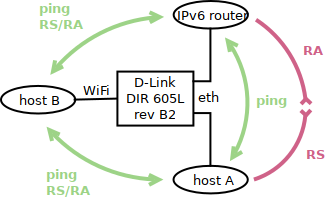 I used ndppd, an NDP proxy daemon, so that our ISP modem believes that the IPv6 hosts are located on the same link and not one or more hop away (as they really are indeed, there is an intermediate router between our LAN and the modem). So we don’t need SixXS anymore which is great! I use NSD as my authoritative DNS. Today I made a mistake while entering new AAAA records. Actually it was a bug in one of the scripts we use to manage our zones. Take the following representation, 2001:aaaa:bbbb:cccc::1111:2222:3333:4444, it is not a valid representation for an IPv6 address. According to the RFC4291, the double-colon symbol (::) indicates one or more groups of 16 bits of zeros. Since 8 groups of 16 bits are explicitly written in the preceding representation, the 128 bits of the IPv6 address are already detailed so there can be no extra group of zeros. The reason I made this mistake is that if you often work with /48 prefixes and you don’t care about your 65k subnets, all your IPv6 addresses will have zeros between the prefix and the interface ID. Most programs will detect this as invalid, probably because they use inet_pton() to translate the address into its binary representation. Some others, such as ipv6calc parse the address manually and do not consider this as a buggy representation. In the latter case, the group is considered empty, and the double-colon implicitly translated to a single colon. If you use this kind of invalid representation in a AAAA record, NSD will not reload your zone correctly, but on the other hand, neither will it complain and the queries will be made on a database that still contains your old zone. Of course this would not happen if you used nsd-checkzone to check your zone before reloading it. I’ve been a long time user of IPv6 tunnels from SixXS to provide an access to the IPv6 Internet behind my ISP. These tunnels also allow me to use static IP addresses for my home servers along with static AAAA records and this is cool ! Currently I use several Debian GNU/Linux based soft-routers with two (100 and 1000) Ethernet ports. These are often running on old recycled laptops which consumes around 40 Watts of power at peak level. Next to that the ARM Raspberry Pi platform consumes around 3 Watts of power (though I still have to measure it by myself). So I thought about replacing all my home-routers with those. However the Raspberry Pi model B uses a SMSC LAN951x chip which includes the USB 2.0 Hub and an 10/100 Ethernet controller on top of it (which is known as smsc95xx in the Linux kernel). My main concern was that it would not be fast enough to support the IPv6 tunnel at its peak bandwidth of 60Mbps (that is 30Mbps downstream/upstream). I already use one RPi as an experimental home-router here. Our Internet bandwidth is a bit slow (12Mbps) so the USB-Ethernet shouldn’t be a problem. I’ve conducted quick tests with IPerf and as you can see the results are pretty good as long as it doesn’t involve I/O on the RPi.